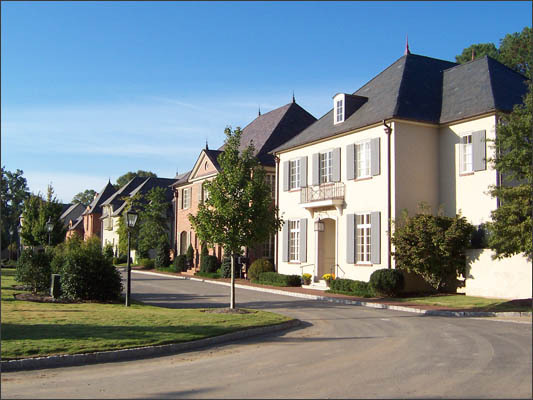 Traditional Neighborhood Development (TND) is the latest trend in planning neighborhoods for the future. It is a departure from the late suburban developments that segment land uses and cause residents to travel for everyday necessities. With the emergence of TND’s, we are seeing a return back to the original neighborhood patterns of the early 20th century. Narrow streets, rear loading garages, and shallow house setbacks encourage conversation between neighbors. Sidewalks with trees lining the streets create a sense of comfort to a child walking to school or a resident going to the nearby village. With TND, we are seeing a return back to communities. TND has become an important aspect of land planning at Nimrod Long and Associates. Through careful site analysis and advanced planning techniques, we help developers see the true potential of their land and how it too can become another great residential community.